This week is all about cleansing for me. Do you ever just reach a point where you realize you need to wake up and make some changes? Sadly, for myself, that means some letting go of some friendships that aren't encouraging to me. I'm looking forward to focusing on the things make my life a more positive place: God, my husband, my family, and the quality friends that i've had for years. All people who encourage me to be who I am, and do what I love (like sharing my love of food on this little blog of mine). On a lighter note, another important part of this cleanse is making healthier habits. I feel like i've been on a binge of overindulgence for the better part of life after my wedding, and i'm ready and excited to get that in check. Don't worry - I'll still share some great recipes along the way, it's all about moderation after all. This week, i've been amping up my vegetable game, and I'm loving roasted butternut squash. It just tastes like fall, doesn't it? I like to balance anything sweet with a bit of savory, and a little parmesan cheese goes a long way in this hearty, healthy veggie dish. Preheat the oven to 450. Spray a cookie sheet generously with cooking spray and add the squash. Spray with a bit more cooking spray. 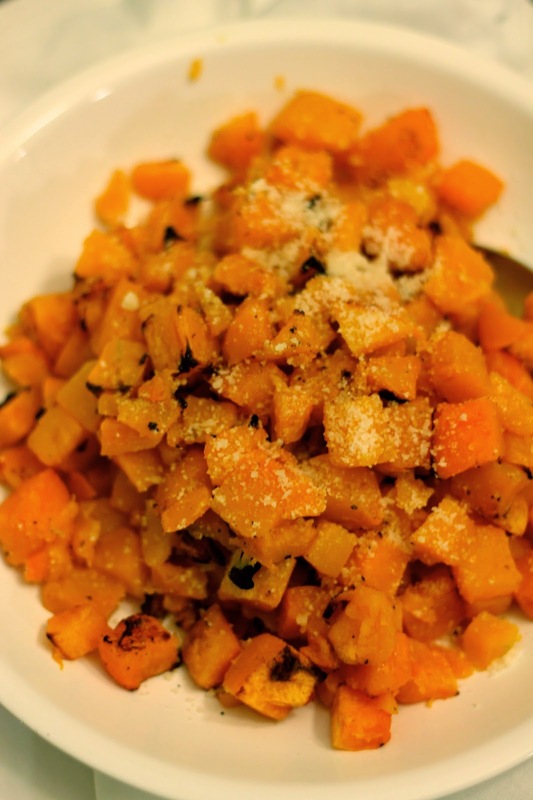 Sprinkle 1 tablespoon of parmesan, garlic powder, salt and pepper overt the squash. Roast for 15-20 minutes or until soft. Stir the squash with a spatula. Increase the temperature to broiling and move the oven rack to the top portion of the oven. Broil for 5-10 minutes, or until the squash starts to brown. Serve immediately, garnished with another tablespoon of parmesan. This looks ahmazing! Cleansing is hard, but trust me, you will feel much better in the long run! Love you friend!